A collection of five films by Finnish filmmaker Eija-Liisa Ahtila, which explore and experiment with storytelling, creating extraordinary tales out of ordinary human experiences. Finnish filmmaker Eija-Liisa Ahtila's films and multi-screen installations explore and experiment with storytelling, creating extraordinary tales out of ordinary human experiences and particularly the unsettling human dramas at the centre of personal relationships. Her masterfully crafted narratives, touching portrayal of characters and highly individual mode of expression have captured the public's interest, whilst also winning critical acclaim. On 31 March 2006 Eija-Liisa beat seven other international artists to win the £40,000 Artes Mundi prize at the National Museum Cardiff. 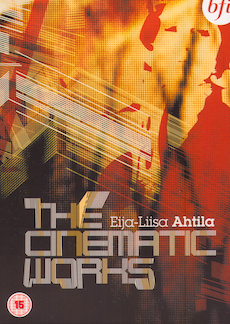 The Cinematic Works is a collection of five films and represents the first time Eija-Liisa Ahtila's work has been released in the UK. Dealing with teenage sexuality, family relations, mental disintegration and death, the films also investigate the processes of perception and attribution of meaning. By mixing and subverting the filmic rules of commercials, cinema verite, pop promos, trailers and documentaries with a lyrical dose of Nordic supernaturalism, the films attain an air of contemporary familiarity combined with intense oddness, giving Ahtila's work its distinctive style. Eija-Liisa Ahtila was born in Hmeenlinna, Finland, in 1959, and now lives and works in Helsinki. Her work has been shown at venues around the world including Tate Modern, London (2002), the San Francisco Museum of Modern Art (2003), the Busan Biennale, South Korea (2004), the Mori Art Museum, Tokyo (2005) and the 51st Venice Biennale (2005). Her films have won numerous film festival awards and visual arts prizes. As part of a retrospective of her installation works in some of the most prominent contemporary art galleries worldwide, the Eija-Liisa Ahtila: real characters, invented worlds exhibition at London's Tate Modern in 2002 exposed Ahtila to a wider British audience. 100-page book including synopses and original scripts of all the films.